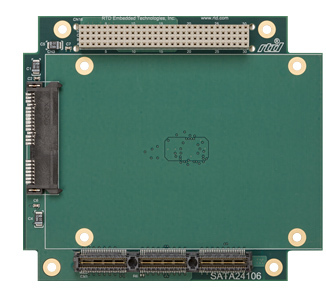 The SATA24106 SATA drive carrier modules provide a mechanism to utilize the SATA links on the PCIe/104 bus connector on select RTD PCI/104-Express cpuModules. The onboard drive utilizes the first SATA link on the connector, while the other SATA link is lane-shifted up the stack to permit stacking multiple SATA drive carrier modules within one system. 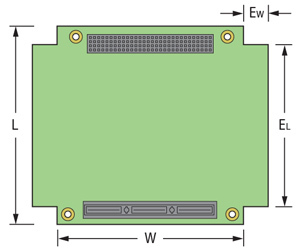 The SATA24106 drive carrier provides power to the SATA drive, sourcing the power from the cpuModule’s onboard connector, and thus eliminates the need for external out-of-stack cabling.